Born and raised in Yohohama, Japan, Masato grew up watching and admiring his father – a distinguished sushi chef – in their family’s sushi restaurant. Using this as inspiration for his own career, he trained to become a sushi chef in Japan for ten years before moving to the UK. A further ten years of experience included setting up a new sushi restaurant in London, and working in some of the most prestigious restaurants specialising in sushi, including Mitsukoshi and Nobu. 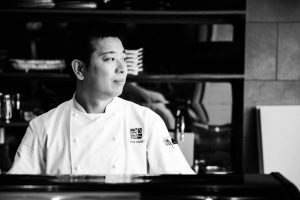 As a sushi chef, Masato believes that a firm attitude toward serving fresh, quality, and seasonal seafood and hospitality to each of the customers at all times is critical for success. He takes care to watch and talk to customers carefully through the counter and serve the most suitable dishes for each of them.